Wish you a very good day. Now, you all must be thinking – What a name !! Today, we will talk and try to feel fragrances. A woman’s perfume or fragrance shows her taste, character, preference, mood and fantasies. Perfumes are our secret feminine weapons 😉 The fragrance you exude is equally important as your makeup or your clothes or hair. In fact, no one wants to be near to the person, well made up but almost stinking!! All those who travel by public transportations means will understand what I am saying. It becomes horrible sometimes. Ok, we won’t go into stinking details here J but we will go for the pleasantness of the perfumes that pleasure us and uplift our mood and senses. 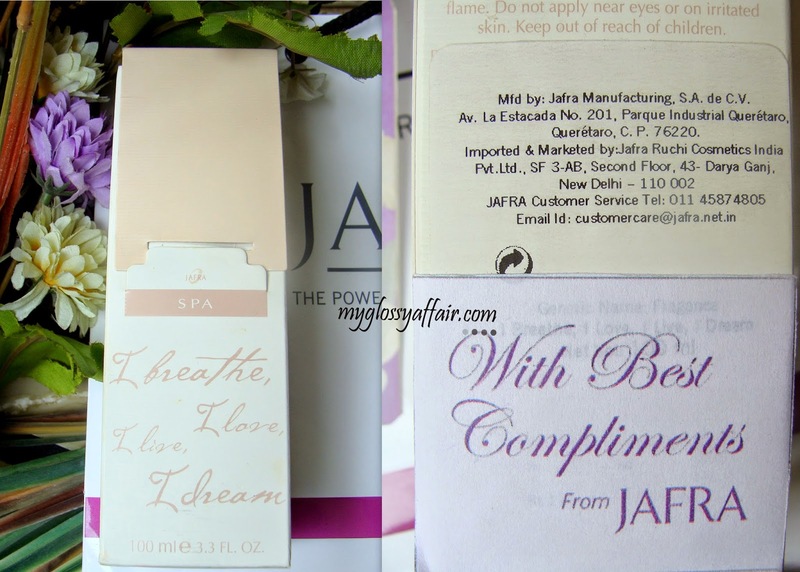 In my recent Jafra visit, I got the goody bag, which I shared with you here, I got 2 amazingly fresh perfumes, which are their new launches. 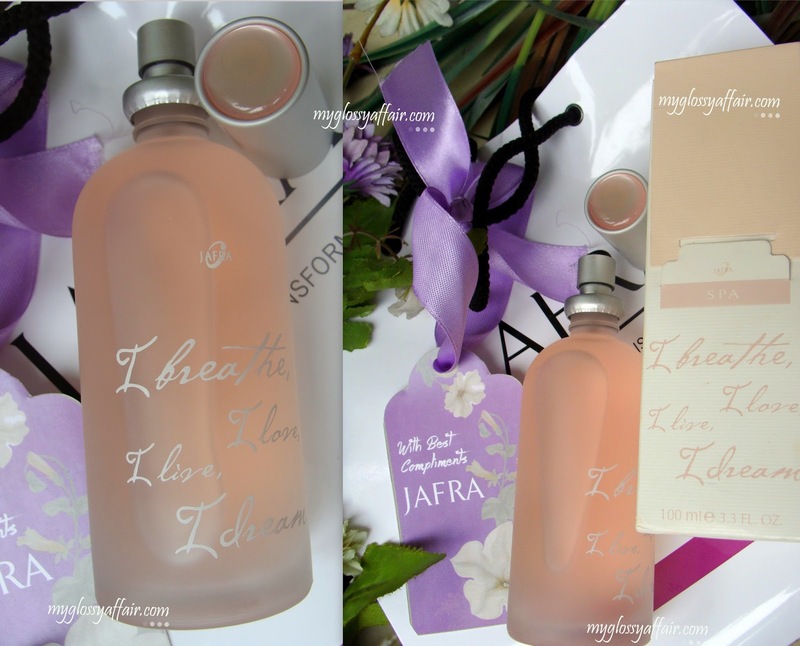 Let’s talk about Jafra – I breathe, I love, I live, I dream. A very relaxing perfume, very heavenly scented, soothes our senses. Sensuous musk mixes with Chinese daphne and Egyptian jasmine with top notes of tropical bamboo, white hyacinth and blooming honeysuckle to nourish the soul. honeysuckle, peach tree blossoms and pink lotus flowers. A deeply floral heart palpitates with velvety acacia, timid hawthorne, spicy carnations and redolent daphne odor flowers from China. Egyptian jasmine with fruit notes of mirabelle and tagetes from Kenya add a feminine accent. An enveloping musk background, clean and sensuous, provides support for a warm duo of woods: osyris wood from Indonesia and Lebanese cedarwood. Spray on as desired anytime you feel like enhancing your mood. All this goodness plus an amazing fragrance packed in 1 big bottle. Great!! Oh yes I would recommend it, it has the qualities of becoming your signature perfume. It helps you be more confident about yourself. It goes on whole day long. The size of bottle is great!! I believe you should first test a perfume at store as no single fragrance is there that can work for all of use!! Its a matter of personal taste J. Great post and pictures,thanks for sharing! That looks so good! I've never heard of this brand before! The fragrance sound divine I will not mind using. Have a great weekend doll. Gorgeous products and I almost can get the scent by staring at them. What cute bottles, they sound like a wonderful product! So pretty but sounds really good! Nice review and cute packaging! The packaging on those is really gorgeous! I appreciate all the note descriptions, I can really get a sense of what it might smell like. Thanks for checking out my blog! Followed you on GFC, Bloglovin, and Facebook! Great review. This perfume looks so luxurious! I have tried this fragrance, and I love it! Great review my dear! Oh wow, you make me want to try it! Great post, I'll have to check them out! The bottle is so pretty and feminine…I would love to have this sitting on my vanity. The scent sounds so refreshing and uplifting. Sounds like a great perfume! Thanks for sharing, and love the design of the bottle. Great products, and thanks for sharing your review. Never heard of the brand beofre, but the bottle and the packaging look so beautiful, and the product itself sounds nice! Wow the perfume look great. Awesomely reviewed .